I love the pineapple motif. During the holiday season, I like to make customized versions of the same design for several people on my gift list. It makes it easier for me to remember the pattern but I can also create something special and unique for everyone. 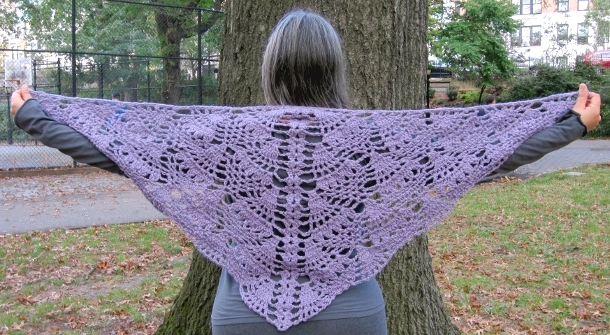 Pineapples for Everyone is a shawl recipe that allows you to create a customized shawl for several girls and ladies on your holiday list. The length is easily adjusted by increasing the number of repeats. The design works equally well in a lightweight yarn or in a bulky yarn. For the sample, I used an eco-friendly thick and thin yarn to add some texture while making a great gift for an environmentally conscious friend. Gauge: 5 rows = 4″ in pattern. Exact gauge is not critical for this project. Dc3tog = double crochet 3 together (decrease) = *Yo, insert hook in next st, yo and draw up a loop, yo and pull through first 2 loops on hook. * Repeat from * to * twice. Yo and pull through 4 remaining loops on hook. Shell = (3 dc, ch 3, 3 dc). Note: Never stitch in dc of the previous shell. Each shell is worked into ch-3 sp of previous shell. Ch 4. Join with sl st to first ch. Row 1: Ch 3 (counts as dc here and throughout). Ch 1, make 3 dc in ring, ch 3, make 3 dc in ring, ch 1, dc in ring. Row 2: Turn. Ch 3. *Ch 1, make 3 dc in ch-1 sp, ch 1. * Sk 3 dc, shell in ch-3 sp, sk 3 dc. Repeat from * to * once. Dc in 3rd ch of turning ch. Optional: Attach stitch marker or scrap yarn to ch-3 sp on shell. Move marker up each row to mark shell. Row 3: Turn. Ch 3. *Ch 3, 2 dc in next dc, dc in next dc, 2 dc in next dc, ch 3. * Sk 3 dc of previous shell, shell in ch-3 sp, sk 3 dc of previous shell. Repeat from * to * once. Dc in 3rd ch of t-ch. from * to * once. Dc in 3rd ch of t-ch. in 3rd ch of t-ch. Row 6: Turn. Ch 3. *Ch 3, (dc in next dc, ch 2) 5 times, dc in next dc, ch 3. * Ch 2, sk 3 dc of previous shell, shell in ch-3 sp, sk 3 dc of previous shell., ch 2. Repeat from * to * once. Dc in 3rd ch of t-ch. sp, sk 3 dc of previous shell. Repeat from * to * once. Dc in 3rd ch of t-ch. 4 times, sc in next ch-3 sp. * Repeat from * to * across to shell, ending last repeat at ** before shell. Sk 3 dc of previous shell, shell in ch-3 sp, sk 3 dc of previous shell. Repeat from * to * across to end, ending last repeat at ** before last st. Dc in 3rd ch of t-ch. * across to shell, ending last repeat at ** before shell. Sk 3 dc of previous shell, shell in ch-3 sp, sk 3 dc of previous shell. Repeat from * to * across to end, ending last repeat at ** before last st. Dc in 3rd ch of t-ch. Row 11: Turn. Ch 3. *Ch 3, (dc in next dc, ch 1) 5 times, dc in next dc, ch 3. ** (Sc in next ch-2 sp, ch 2) 3 times, sc in next ch-2 sp. * Repeat from * to * across to shell, ending last repeat at ** before shell. Sk 3 dc of previous shell, shell in ch-3 sp, sk 3 dc of previous shell. Repeat from * to * across to end, ending last repeat at ** before last st. Dc in 3rd ch of t-ch. last repeat at ** before shell. Sk 3 dc of previous shell, shell in ch-3 sp, sk 3 dc of previous shell. Repeat from * to * across to end, ending last repeat at ** before last st. Dc in 3rd ch of t-ch. before shell. Ch 2, sk 3 dc of previous shell, shell in ch-3 sp, sk 3 dc of previous shell, ch 2. Repeat from * to * across to end, ending last repeat at ** before last st. Ch 2. Dc in 3rd ch of t-ch. Row 14: Turn. Ch 6. +3 dc in ch-5 sp.+ *Ch 3, (dc3tog in next 3 dc, ch 4) 4 times, dc3tog in next 3 dc, ch 3. ** 3 dc in ch-2 sp between 2 sc. * Repeat from * to * across to shell, ending last repeat at ** before shell. Repeat from + to + once. Ch 3, sk 3 dc of previous shell, shell in ch-3 sp, sk 3 dc of previous shell, ch 3. Repeat from + to + once. Repeat from * to * across to end, ending last repeat at ** before last dc (t-ch). Repeat from + to + once. Ch 3, dc in 3rd ch of t-ch. Repeat Rows 9-14 until desired length is reached, ending on Row 12. Row 1: Turn to work along long straight edge of shawl. Ch 1. 2 sc in each t-ch and ch-3 sp across to shell. Sc in center of first shell. 2 sc in each t-ch and ch-3 sp across to end. Fasten off. With yarn needle, weave in ends. Spray block if necessary to open up pineapples. Marie Segares, proprietress of Underground Crafter, has been crocheting for over 27 years. She recently picked up knitting after fearing it since childhood and is now happily bi-craftual. 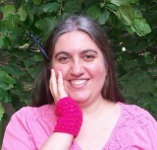 Marie teaches crochet and knit lessons in New York City and at regional fiber events. 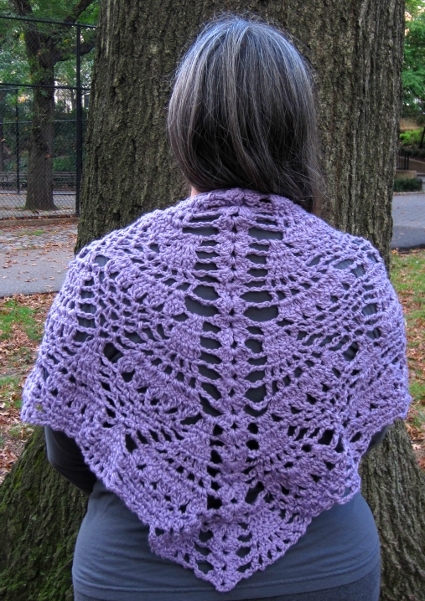 Her designs have been published in KnitCircus, Crochet World, and Inside Crochet. She blogs regularly at the Underground Crafter Blog. For pattern support, contact Marie at marie@undergroundcrafter.com. Pattern & images © Marie Segares. All rights reserved. Hello to you and may I say such a nice shwal! it is a written pattern? much easy to follow while crocheting, luch easy to visualise what we do …. Thanks for sharing your feedback, FleurBeige. All the patterns on Crochetvolution are written patterns and I don’t have access to charting software at this time. Thanks so much for sharing the pattern with your friends, Jackie! Thanks for sharing this pattern. I look forward to trying it and I’ll send you a picture. I love the pineapple pattern. Thanks, Mary! I’d love to see a picture when it is finished. Hello,wht an awesome item you have there,would there be any chance you maybe able to email the pattern to me,so I maybe able to get it printed. Been serching for this sort of item for longer than I wish to remember. Thanks, victoria! You can actually print it directly from this website. Enjoy! Thank you so much Marie for this pattern! After searching through and looking for just the right pineapple stitch shawl to learn from and make – I have settled on yours- it looks beautiful! I also can read through the instructions and I think I can follow them! I’m a pretty new crocheter and love this stitch so much! Thank you for taking the time to design and write it down for all of us to use! Thanks for the kind words, Denise! I’d love to see a finished picture of your shawl. Thank you! I have been wanting to learn pineapples. And as one who hasn’t quite figured out actually crocheting off a chart I am glad for the written pattern!